LDS Bookstore: (RECOMMENDED BOOKS) Click on the recommended book pictures or underlines below to read about these LDS books and how to purchase these books at Amazon.com. PayPal Purchase Presents: "The Mormon Conspiracy"
A Review of Present Day and Historical Conspiracies by the Mormon Church also known as LDS Church of Jesus Christ of Latter-Day Saints, to Mormonize America and the World. A very comprehensive volume dealing with issues that most others who have written about the Mormon Church have left untouched, namely the political ambitions of the Church of Jesus Christ of Latter-Day Saints and how they have become successful toward this goal, unnoticed by the majority of Americans. He has captured the "spirit of Mormonism" and understood the internal structure amazingly well without ever having been a Mormon. Dr. Wood's research and conclusions show originality and give helpful conclusions which open the reader's mind to see the true nature and plan of the Mormon Church for America-and the world. "Absolutely a good book, an eye opener." "I read it for six hours, I couldn't put it down." "I couldn't believe that the Mormon Church was worth 50 Billion Dollars. They must own half of Utah"
"That's the way I see it! It's all true!" Joseph Smith, the founder of Mormonism, declared his Book of Mormon to be "…the most correct of any book on earth." However, this careful study reveals a large number of serious errors. For example, his characters had access to spring steel, window glass, machinery, and submarines centuries before these things were invented. They also had horses, chariots, elephants, silk, and linen contrary to the claims of archaeologists, anthropologists, and other scientists. Smith's Nephites and Lamanites were alone here in their "promised land" despite overwhelming scientific proof that many other civilizations have been in America for thousands of years. Also, his "prophets" quoted Old and New Testament Prophets hundreds of years before these men were born in the Old World. 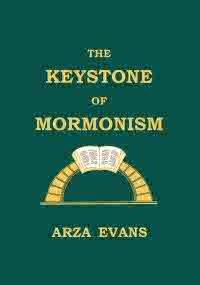 The Keystone of Mormonism documents these and other serious errors in Smith's book. A Mormon Odyssey takes the reader into the heart and soul of a Mormon couple who discover that the religion of their heritage is laced with a web of lies, deceit, and cover-up. They began their journeys separately, each motivated by a desire to learn the unvarnished truth about the religion they had come to embrace. As they followed the trail of Mormonism from before its inception they discovered a history at odds with itself, where truth was illusive and nothing was what it seemed. Join their heart-wrenching journey through Mormonism and beyond. Based upon the personal experiences of the author and her husband followed by an in-depth research into the original documentation of the religion, they learn things about the Mormon Church and themselves that they never dreamed. Their integrity is tested, their minds are challenged, and their hearts are broken. It took tremendous courage and commitment to take such a journey but in the end they have triumphed, discovering that spirituality lives in the heart of the individual not in religious doctrine. A Mormon Odyssey is so touching, so informative, and so thoroughly documented that it may well change the reader's life. The ideal of being a rational person is to, at some point, critically examine one's own inherited beliefs. Yet, few who do take up this challenge are equipped to withstand the self-doubt and unsettling disorientation which may follow. The narrative of this book is that rare instance where two brothers of deep moral conviction and intelligence summon the energy and conviction to see this ordeal through to its conclusion. The end result unmasks insights of enduring power. This book has the appeal of a good mystery, and I had the same sense of satisfaction of a mystery being solved. Robert, B. H. "Studies of the Book of Mormon"
From Housewife to Heretic Johnson, Sonia. "From Housewife to Heretic"
D. Quinn Michael D. "The Mormon Hierarchy, Extensions of Power"
Brooks, Juanita. "The Mountain Meadows Massacre"